This early 1990s black sequined dress is 50% plastic, 38% acrylic, 5% cotton, and 7% elastic and was made in the USA. It's sleeveless and has a scoop neckline. 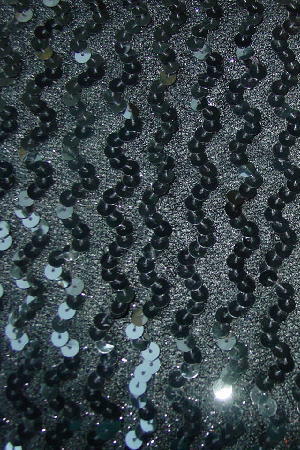 There is a black fabric base with flecks of iridescent black thread and vertical curvy rows of black sequins. The tag says M/L, but it fits like a size 6.
shoulder to shoulder 13 1/4"